Subaru will drop the five-door hatchback body style from the 2015 Subaru WRX and WRX STI lineup. Subaru is changing their entire lineup in the coming years and we can look for them to drop the five-door model from the 2015 WRX and WRX STI lineup. The performance models will no longer be available in the five-door hatchback versions after the 2014 model year. This is being reported by Automotive News and we can also expect the new 2015 Subaru WRX and WRX STI to make their debut at the Los Angeles Auto Show coming up later this year. What other changes are coming to Subaru? The new model WRX and WRX STI will be redesigned for the 2015 model year and should make their global debut here in the U.S. in November in LA. They are expected to go on sale in early 2014. Subaru will only produce the performance models in the sedan version and drop the hatch model when it gets the new design. This is likely due to slower sales of the five-door hatch and it will also save on production costs. When Subaru unveiled the new WRX Concept in March at the New York Auto Show, they only had the coupe styled variant. The new WRX coming out next year will likely feature a high-performance version of the 2.5-liter four-cylinder boxer that will produce more horsepower than the current model. Look for Subaru to bump up the hp and give the new WRX new suspension goodies from performance tuner STI in Japan. The incredibly popular BRZ will get an update and is expected to get the refresh in late 2015 for the 2016 model year. We know a new drop-top variant is being considered and is already on the drawing board but it will require some major changes. Subaru engineers have said the BRZ wheelbase would have to be stretched about four inches to provide enough rear-seat room for a droptop version. Look for Subaru to bring out the convertible BRZ in the near future. Look for new versions of the Outback wagon and Legacy sedan in 2015. AN reports that they will both receive new designs in the third quarter of 2014. Recent spy shots have shown the Outback with a more steeply raked windshield and changes to the hood and front-end. Legacy spy photos show a sleeker coupe-like appearance. Both will receive major updates for 2015. As we reported yesterday, Subaru is also working on a new seven-seat crossover replacement for the Tribeca. Look for many new things coming out of Subaru in the next few years as they update their lineup. 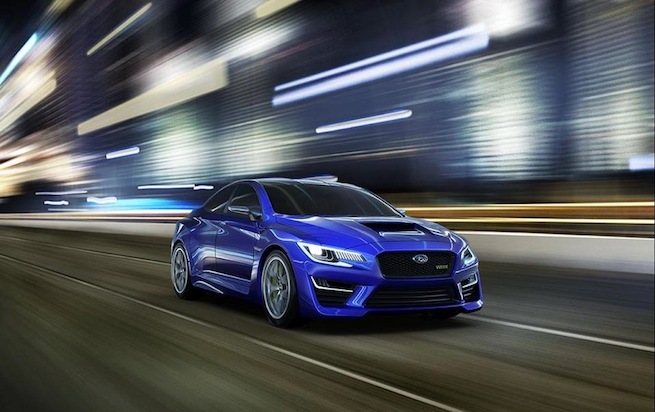 The all-new performance 2015 Subaru WRX STI is getting closer to reality. Look for it to make its global debut in LA in November. Stay tuned to Torque News for the latest Subaru updates.